Today, I’m continuing with my blog series, walking new readers through the various Drake & Elliott series. Just last week, we chatted about the Unbreakable Bonds series. It was the series that started it all for Rinda and me. And once we set Rowe Ward loose on the world, we quickly realized that he was very likely to hire daredevils, troublemakers, and men with hearts of gold just like himself. 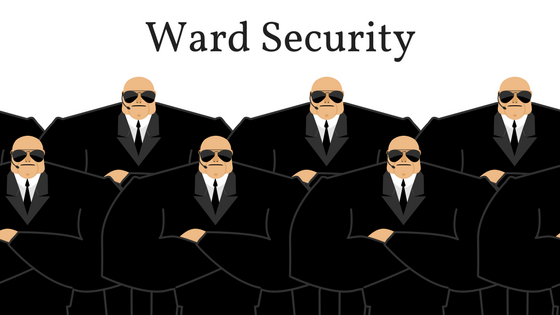 So, it was only natural for us to create a spin-off series called Ward Security. 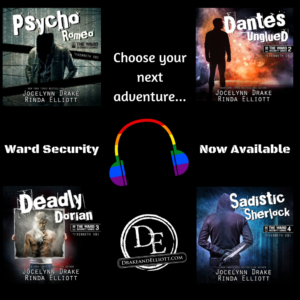 The Ward Security follows the employees of Rowe’s company as they protect clients, help private investigators, and generally get into trouble when their own pasts come calling. To kick off the Ward Security series, we decided to visit a favorite character from Unbreakable Bonds, Geoffrey Ralse. He’s the lithe and flirty guy who had a thing for Snow. 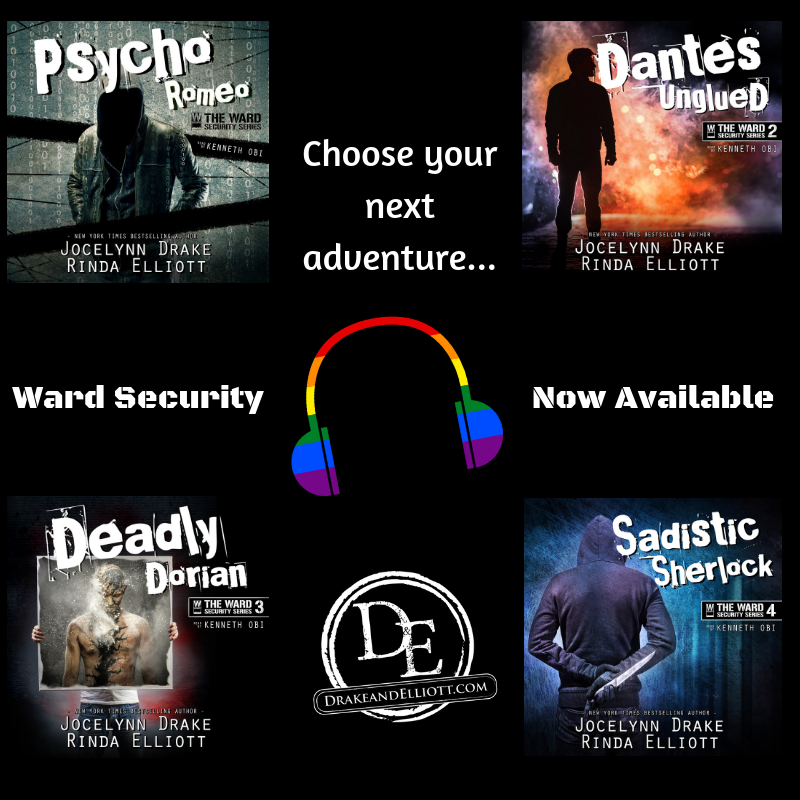 And if you love audiobooks, the series is currently available in audio format for your listening pleasure. Click here for more details. As you’ll notice, the titles are a bit different from the Unbreakable Bonds series. We thought we’d have a little fun with this series. The plots of the books are all loosely linked to different classics from literature. Dantès Unglued – this story loosely follows the revenge plot from The Count of Monte Cristo by Alexandre Dumas. The main character who was wronged was named Edmond Dantès. This is not a play on Dante’s Inferno as many people believe. Deadly Dorian – this is a reference to The Picture of Dorian Gray by Oscar Wilde. Sadistic Sherlock – And finally, we play with Sir Arthur Conan Doyle’s Sherlock Holmes story called The Dancing Men. Naturally, you don’t have to have read any of these classics to enjoy these books. It’s just a fun little thing we’ve done as a nod to our love of the classics. I have all this series, love all the characters and the story lines .but Hollis is my all time favourite, not sure why but would a Hollis all of my own lol. Please continue writing about the Ward bodyguards. Loved all (5) books and hope we get to find out about the other men who work at Ward.